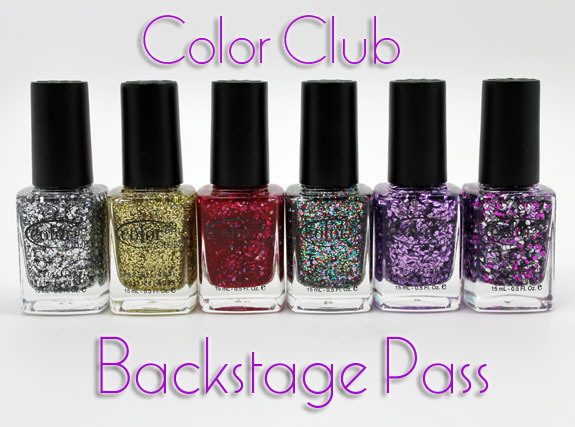 Color Club Backstage Pass is a glittery, festive collection for the holiday season this year. But you best make sure you have MAJOR patience! These aren’t your garden variety glitters. Nay. They are super crazy multi-colored, shaped and sized glitters and all but one are set in a clear base. You can use them as a layer atop a colored polish or pack ’em on for a majorly glittery effect. But that’s where your patience will be required because these are a bit difficult to work with. 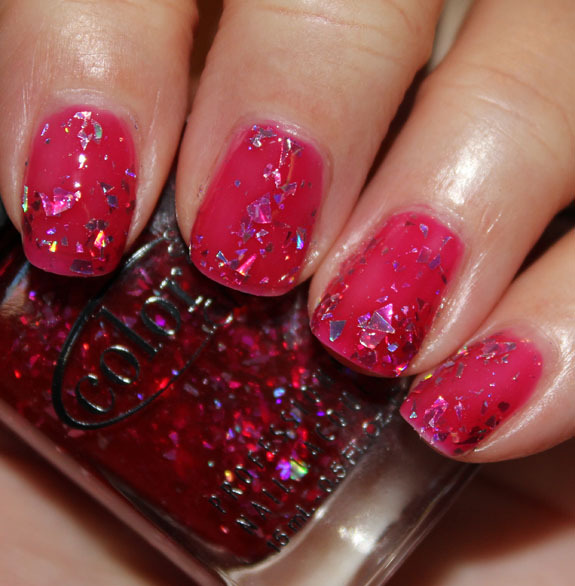 Fame & Fortune has a bright pinkish/red base and has jagged, multi-shaped flake glitter. It looks like shards of a broken mirror! Pretty cool I think. I liked this one because of the colored base. I’m not much of a fan of glitter suspended in clear unless it covers REALLY well. This was two coats and really the easiest one to use. It’s A Hit! 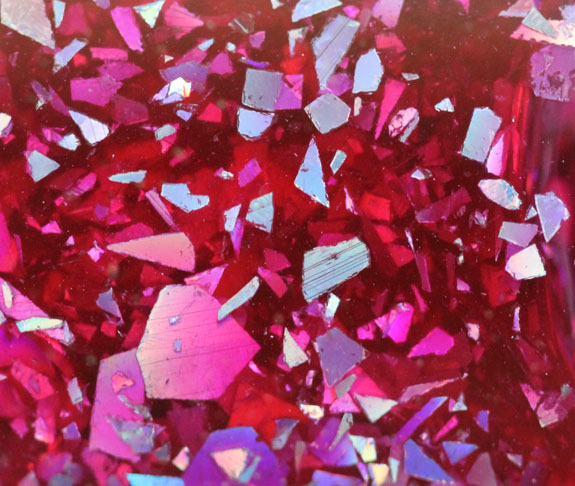 has large hexagonal mirror-like purple glitter in it. This wasn’t easy to work with. It’s hard getting the glitter off the brush onto your nail where you want it. If you don’t wait awhile in-between coats it just moves all over the place. Also it doesn’t want to lay flat. This was two coats. 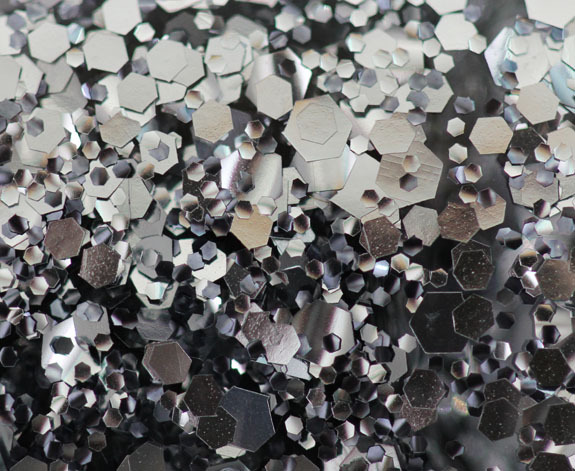 Platinum Record is a glitter jam packed with large, medium and small silver hexagonal glitter. Again it’s got that super shiny mirror-like finish, which I really like. 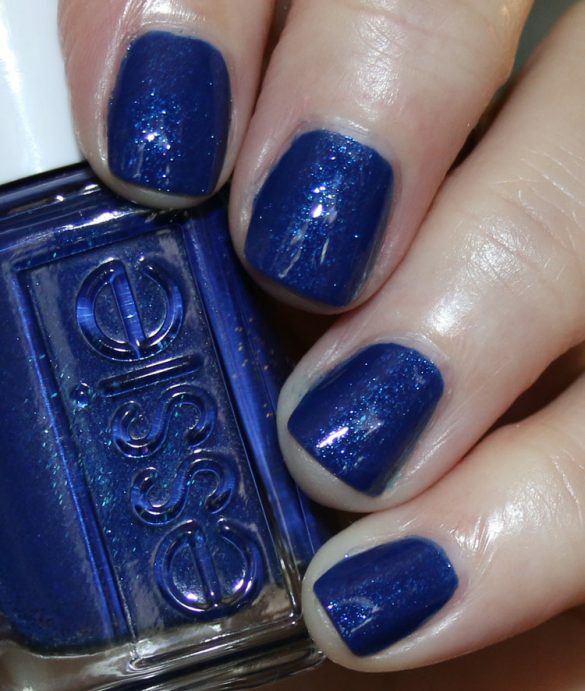 This one was REALLY thick and has so much glitter that you can get pretty good coverage with just a couple coats. It’s a little easier to work with than some of the others, but still you have to have some patience in-between coats. 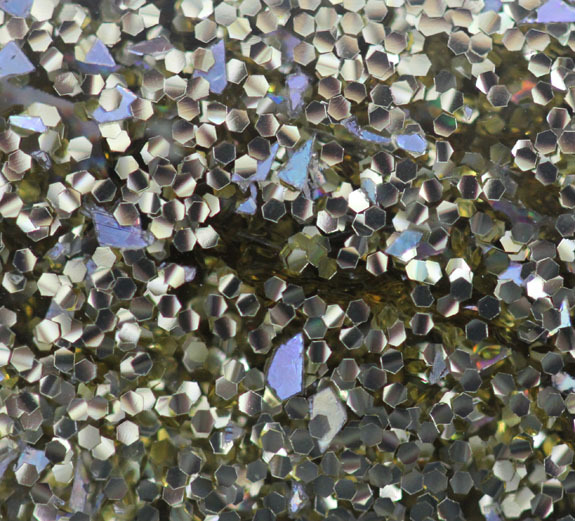 Take The Stage is a glitter that has small gold hexagonal glitter as well as larger iridescent flake glitter. Really interesting combo, I don’t think I have seen one like this before. I wound up liking this one because it’s easier to apply than the large hexagonal glitter and I got fairly good coverage. This was three coats. 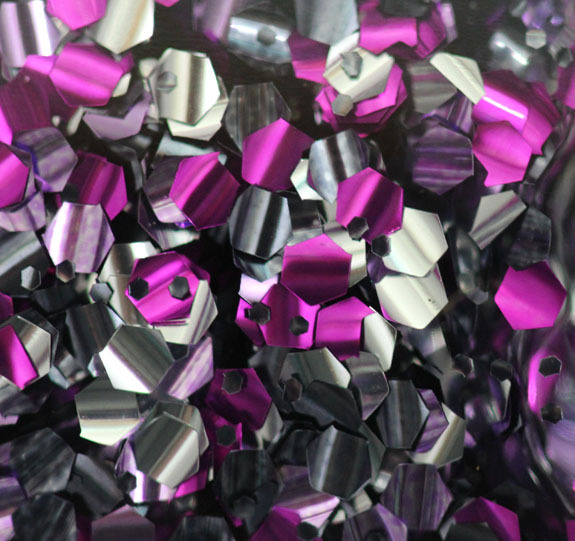 Backstage Pass includes large fuchsia hexagonal glitter, large silver hexagonal glitter and small silver hexagonal glitter. This, like It’s A Hit! was fairly frustrating to work with. 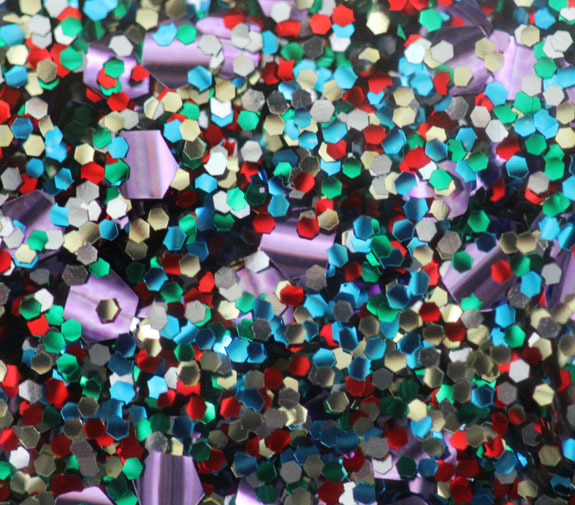 Larger glitter just isn’t easy to get into (and stay into) place! The smaller glitter bits are pretty sparse and I don’t know if they really add anything to the polish. This was three coats. 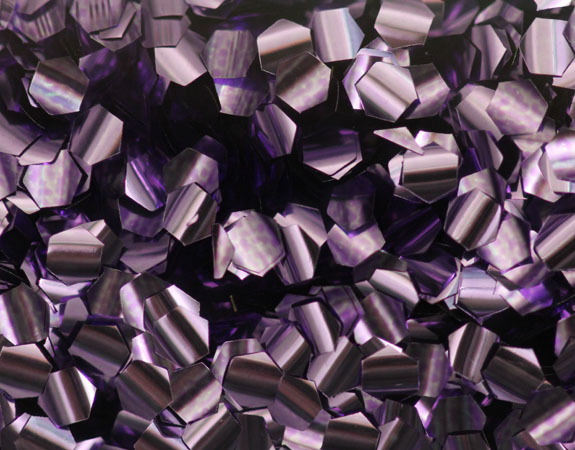 Wish Upon A Rock Star is a glitter that includes small hexagonal green, blue, red, silver and gold glitter as well as large violet hexagonal glitter. The color scheme is reminiscent of Deborah Lippmann’s Happy Birthday (and possible Finger Paints Fun-Fetti which I have but haven’t tried yet) and also Wet n Wild Party of Five. This was also easier to work with than the larger glitter colors and I got great coverage with three coats. 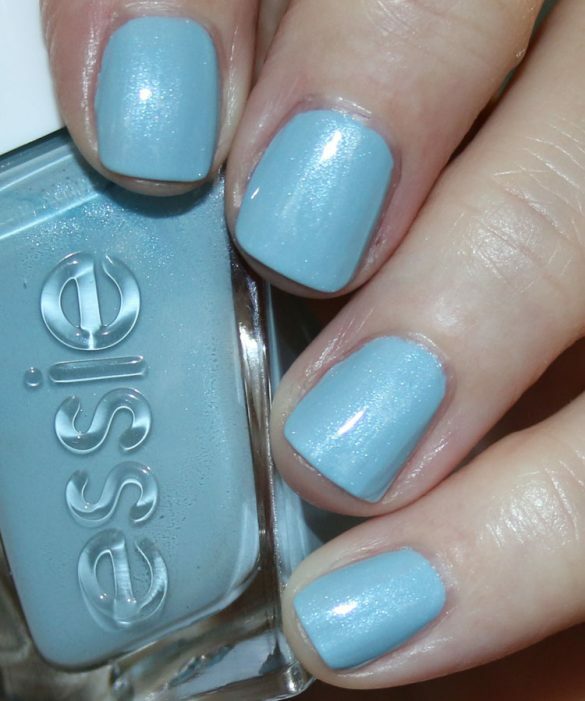 If you love glitters suspended in clear polish, then this might be your bag, baby. If not or you have no patience to work with them, you may not love them all. My favorite ones were Take The Stage, Fame & Fortune and Wish Upon A Rock Star. How are you feeling about Backstage Pass? that new macro lens is great…love these!! I like these, they’re fun. For the price, I may definitely have to pick one or two up..Platinum Record and Fame/Fortune.. And once again the photos are amazing! I love that you posted macro pics! 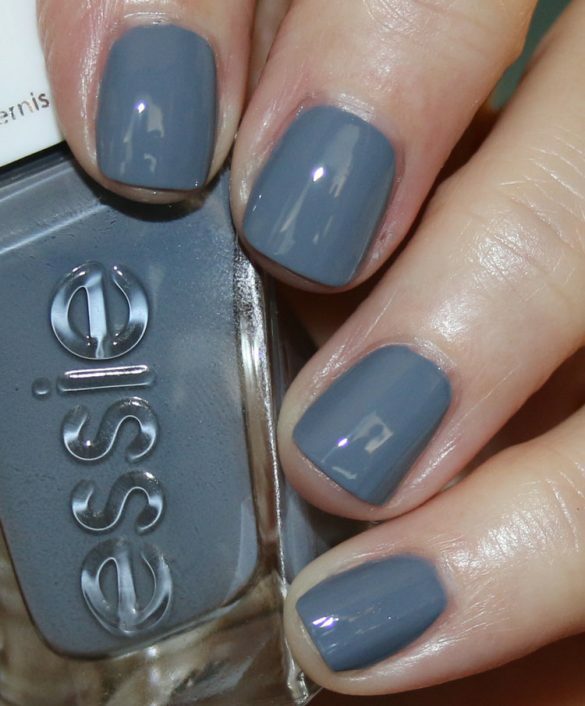 It’s easier to get an idea of what;s in the polish. I agree with Carrie. It was a good idea, but the end result on the nail leaves something to be desired. It’s too bad. But I do appreciate your awesome macro shots – really sharp! I’m pretty sure that Funky Fingers Heavy Metal is a dupe of Platinum Record. It applies much easier for me too! I really don’t like how all the big hex glitters seem to be curling up. 🙁 I wonder if they just chose the wrong type of plastic to suspend in the base because I don’t really see this happen with ChG or Lippmann glitters! It does look that way because of the mirror reflection of them but in fact they are not curled. It only looks curled in the bottle not really so much on the nail. Oh, phew! That’s good to know. Trying to smooth them out would be a nightmare if they ended up curling. I was wondering the same thing! Good to know that it’s just an optical illusion. And Kelly, your macro shots are superb! You are like THE person who takes macro shots. Nobody comes close!! Oh my, those macro shots are amazing! Really helps to see the detail of the glitters. For the price these would be great to try. Thank you for the photos! I love glitter, but to me Color Club really ruined these. They just look weird, except for maybe Wish Upon A Rock Star. I love the macro shots as well….I’m tempted to wallpaper them! Aside from that though, I just can’t find these appealing. They look like some kind of terrible glitter glue accident at art camp. The obsessive compulsive side of me also intensely dislikes the uneven distribution. If you can’t get them to go on evenly, I doubt the rest of us could do it! I wish they had done a collection of RBL Locavore-esque polishes instead. I think I like the non large hex ones better too. They larger ones seems so sparse and it doesn’t look as good as a result. Somehow, the large chunky glitter looks out of place on the nails. Maybe it would look better with a base coat. Which is exactly what I will do with them. Holy Moly, those macro shots are AMAZING. I’m skipping on this collection though, not really a huge fan of these 🙁 Thanks for sharing! My favorite part of the collection are your macros! Some of these just look like chunky nightmares in every way! I picked up Color Club’s Orna-Minty… It looks suspiciously similar to Platinum Record, only smells like mint. I was so excited when I got it, but it clumps and is hard to spread evenly. Like you said, if you have the patience to do it, they are really pretty. But after my experience with Orna-minty, I think I would also have to pass. 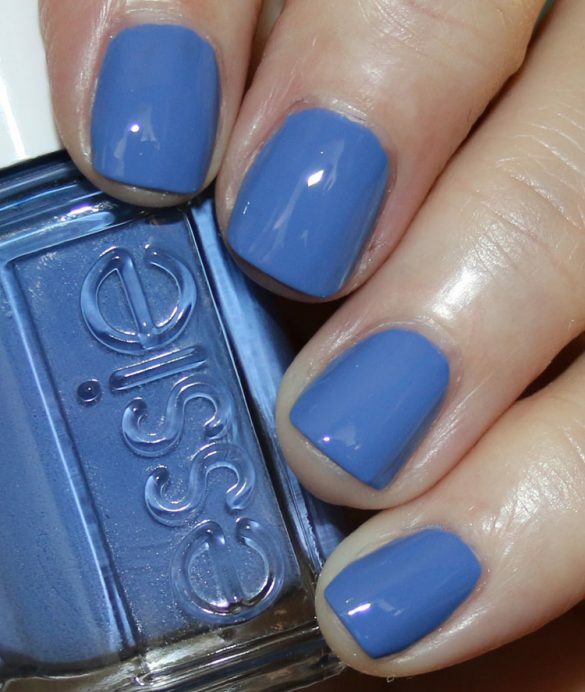 It may be good for some nail art designs, or just on the tips, maybe, but I don’t like how it looks on a full nail. LOVE the dimensional look of the glitter in Backstage Pass and It’s A Hit, but I too would much prefer these if they were in a tinted base! Which macro lens did you get?! Amazing pictures! On a side note, not loving the polished. I thot I’d be all over them, but it all looks too chunky. Love Wish Upon a Rock Star. The rest I will definitely not buy. I have so many glitters. Your macro shots are fantastic. Your the best! I find the glitter combo in Take The Stage intriguing but overall I’m not a fan of these. Maybe the’d be better off layered but as they stand I actually really dislike them. I really enjoy your blog for sometime now. Thanks for the awsome work on your blog. Kelly, I definitely like the small glittered ones! The larger flaky ones would be to frustrating to use! 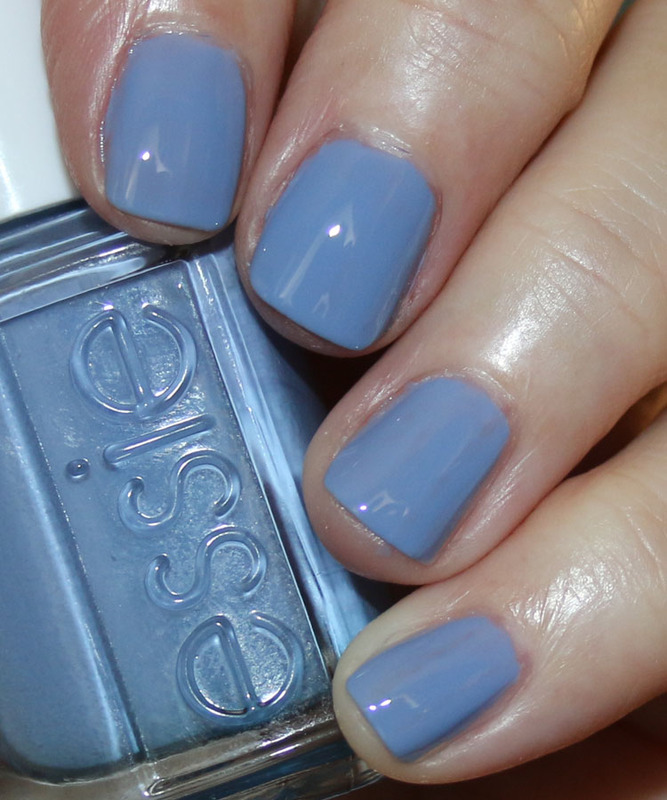 Hooray for YOUR patience so we get a great idea of what the polishes look like on the nail! I love Fame and Fortune, the others are cool and edgy as well.